Swimming pool tourism? That’s right. You read it first here. Iceland is famous for its geothermal activity. Ingenuity has led to utilizing the environmentally sound geothermal energy for 99% of the county’s energy needs. But do you know the unsung hero of all this hot water? It also happens to be the easiest way for foreign visitors to connect with locals in modern Icelandic tradition. The answer is easy. It’s a trip to your local swimming pool. What I’m talking about are Iceland’s public swimming pools. There is one in nearly every town around the country, and there are some seriously small towns in Iceland. But no doubt, there will be a swimming pool there. Reykjavik alone has more than eight public pools. 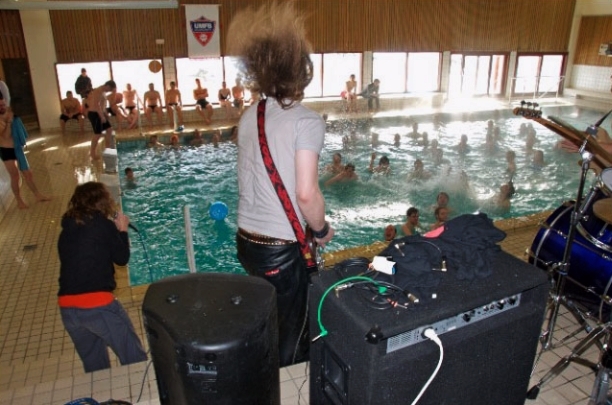 Pools play an important part in modern Icelandic society. Although the country hasn’t won an Olympic medal in this category (handball is their real specialty, by the way), all Icelanders are required to learn how to swim. Regardless of the fact that I tout swimming pool tourism as an excellent way into Icelandic culture, you will still bump shoulders with some expats and travelers. Pick your pool wisely: some are located in strictly residential areas. Here you are bound to be surrounded by both bearded and bikini-clad Icelanders. The temperature was hovering above freezing most of the time while I visited in November, but when the wind whips through, as it often does, it chills you to the bone. Besides the thought of spending the bulk of each day submerged in a 40-degree-Celsius pool was the comforting notion that the hostel would be super-cozy warm (free heating after all) with unlimited hot showers (no need to be concerned with wasting an endless resource). With these facts in mind I booked my return one-way ticket from Europe to the U.S. using Iceland Air, which also happened to be the cheapest way home. Iceland Air offers a free stopover for up to seven days. Good for us — even better for them (the airline owns a series of hotels and tour services around the country). My fascination with this seemingly ordinary activity began three months prior when visiting Iceland in the summer (when I also booked a stopover). In the small town of Hveragerdi, less than an hour outside of Reykjavik, I had set off on a fool’s errand to find a series of natural hot springs located a few miles up a mountainside. Even though it was summer, the weather was cool, rainy and windy, the combination being too much for my wool socks, long underwear and waterproof jacket. We never made it to the springs. In between us and our natural hot spring destination was an impassable gushing stream, spilling over its banks by all the recent rain. This forced us to turn around and return to the car. Sitting in a rental car soaked to the bone is not a preferable way to spend a holiday, so we immediately drove to the Hveragerdi swimming pool, where we soaked for a couple hours in the hot pools and shocked our bodies in the natural steam bath. Back in Reykjavik, months later, I was on a mission: Go to the swimming pool every day for as long as possible. I pulled out my map of Reykjavik and studied it at the front desk of my hostel. With the help of the staff, I strategically planned out my week of pool hopping. Each pool here has a particular character, with its own special features. Downtown-located Sundholin Pool is the oldest, but recently refurbished, and it features an Art Deco swim hall from 1940. Laugardalslaug is the largest complex and features a 50-meter pool and a series of 5 hot pools ranging from 38 to 44 degrees. Vestubaejarrlaug Pool is located in a quiet neighborhood, offering a more local experience. Grafarvogslaug, in the city’s northwest, features a state-of-the-art sports complex in addition to its three hot pools and hydro-massage. Most facilities have children’s pools and waterslides (for kids and adults). The water in the pools, I should note, is actually pumped up from under the earth — it’s not circulated below the ground or heated with electricity. It’s the same hot water that is pumped to every household in the country, and it has a slight odor of sulfur to it. The one thing that every travel writer loves to point out about public swimming pool protocol here is the graphic images in the locker room showing bathers exactly where he or she should wash. There are no chemicals in the water, so it’s important that everyone is clean before entering. The areas are highlighted on the cartoon diagram of a human figure. I followed suit each time and washed my hair and face, under my armpits, my groin, and my feet with the provided soap. The night I was leaving after a swim at Sundholin, I asked two Reykjavik girls about the other pools in town and which they recommended. “They’re each a bit different. But we like Vestubaejarrlaug, and Bjork goes to this one.” They pointed on my map. I smiled and drew a little asterisk next to that one. I was truly falling in love with Iceland. Each pool charges an entrance fee of about 450-500 kroner, which is less than USD$4.00. If you really want to get your Icelander on, get a hot dog and Coke at the snack stand outside the pool in true Icelandic fashion. Stephen Bugno has been traveling the world and writing about it for the past decade. He prefers slow and low to the ground travel and will make a temporary office wherever the weather is warm and the interneting good. He blogs at Bohemian Traveler and GoMadNomad, and you can follow on Twitter: @bohemiantrav.